It is often asked what is the oldest recording to make the UK chart and there is no real definitive answer. We do know, however, that Mike Oldfield’s 1975 Christmas hit In Dulci Jubilo originates from the German mystic Heinrich Seuse around 1328, but it’s likely that the oldest song was a hit exactly 10 years before Mike Oldfield and comes courtesy of the Byrds with their 1965 hit Turn Turn Turn (To Everything There Is A Season). As Pete said, it was first cut by the Limeliters in 1962 and one of the backing singers was Jim McGuinn (later using his middle name Roger) who first rearranged the song for Judy Collins who recorded it in 1964 and Jim played guitar on here version. The following year The Byrds, comprising Jim McGuinn, Gene Clark, David Crosby, Michael Clarke and Chris Hillman, burst into the UK chart with a cover of Bob Dylan’s Mr Tambourine Man which went to number one. Two months later they followed it up with another Dylan cover, All I Really Want to Do which hit number four. 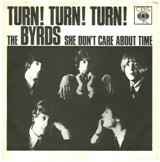 Their third hit of 1965 was their own version of Turn Turn Turn (To Everything There Is A Season) which had yet another new arrangement devised by McGuinn and Crosby which took the band over 50 attempts to get the right sound they wanted. The song has since been covered by numerous people including Mary Hopkin, The Seekers and Dolly Parton. Roger McGuinn also teamed up with country singer Vern Gosdin, who was once a member of Chris Hillman’s Bluegrass band The Hillmen and one half of The Gosdin Brothers (who occasionally opened for The Byrds), for a cover of this song on Gosdin’s 1984 album There Is A Season and McGuinn played the same 12-string Rickenbacker that he used on The Byrds’ recording of the song. It was also used to great effect in the 1994 film Forest Gump. ← German band leader James Last dies at 86.